I’m always intrigued with how trousers came into women’s wardrobes. We find them stylish and practical today, but given that women had centuries of being limited to skirts and dresses, those who first took the plunge into what was solely men’s attire must have been spirited souls indeed. 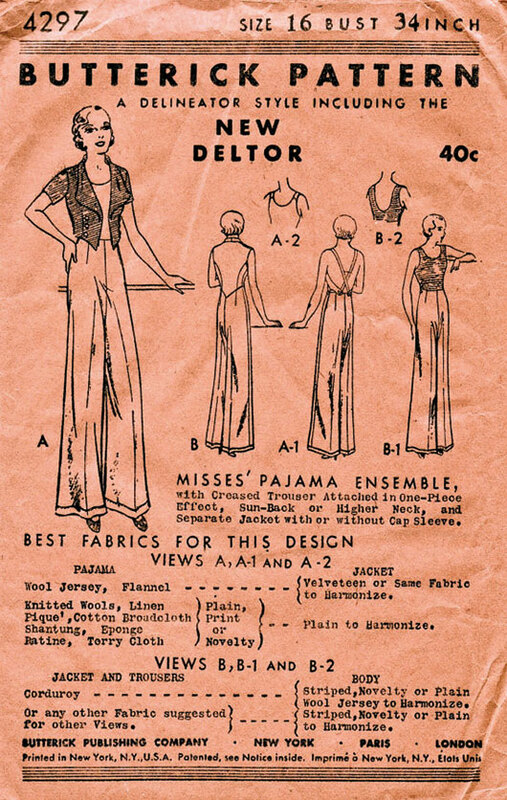 Trousers first made their appearance in a woman’s wardrobe as sleeping pyjamas and then more stylish lounging pyjamas, made for relaxing at home in, for visiting friends for dinner and (for the very fabulous and daring) wearing out on an evening to the theatre. 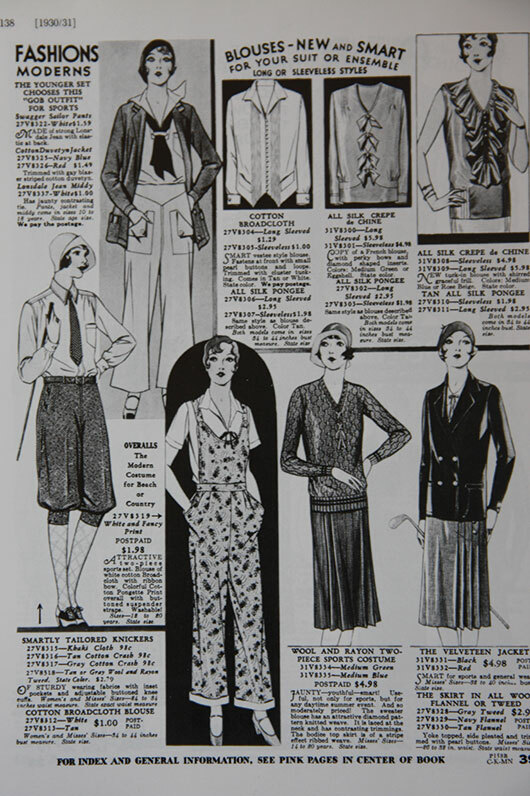 Soon breeches for skiing and jodhpurs for riding were also among the sensible and brave fashions of the mid 20s, closely followed by trousers specifically designed for other outdoor pursuits such as yachting, golf and tennis. As all of these sports were expensive, the trend was a startling, striking one that started with the fashion forward rich. The rich of course were also enjoying travel to far-flung exotic places and this meant a new holiday wardrobe! Quick to sniff a potential sale opportunity Chanel introduced ‘beach pyjamas’ as resort wear. Not too far different to the lounging wear she had already set a trend for, these were first known as ‘gob’ trousers, a slang term for sailor trousers (what we would know today as bell bottoms). Holiday clothes, as they are even now, were a way to escape your normal wardrobe, but now something else was brewing…sunbathing! The pursuit of a tan all of a sudden became a big deal. Up until the 1920s, women would shield themselves from the sun’s rays believing a milky white complexion distinguished oneself from those who had to work out-of-doors. But at the end of that decade sunbathing was the thing to be doing, especially if you were doing it on the Riviera or the beaches of California. The snob-appeal of an off-season tan, and even sunburn, soon drew the international rich to the south of France in waves and being fashionable was terribly important. 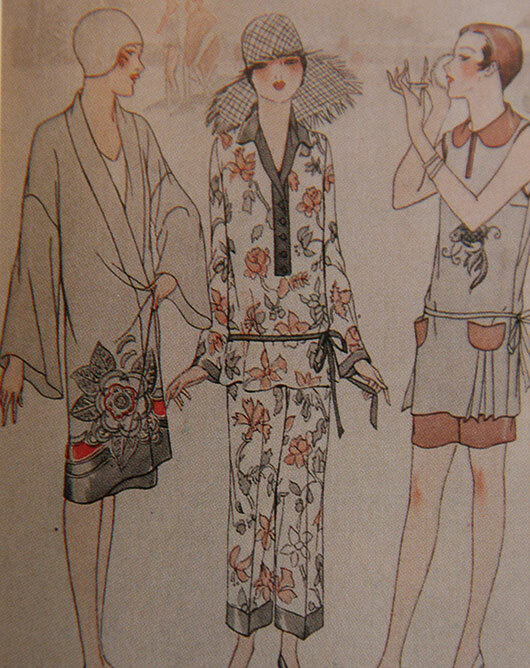 Resort wear was big business and beach pyjamas were NEW! The rising popularity of another entirely new fashion in the 1930s, the backless evening dress, enabled ladies to show off the extent of their tans, and so beach pyjamas moved on from the ‘middy blouse’ above, to having sleeveless or backless tops for maximum tan-ability. An extra matching jacket would take you from the beach on to cocktails. Colours were bright and nautical themes were popular. Fabrics were mostly light weight; silk, rayon, linen and cotton, as you might expect. But a heavier cotton also featured, making the trousers sit proud of the body rather and therefore look even wider. 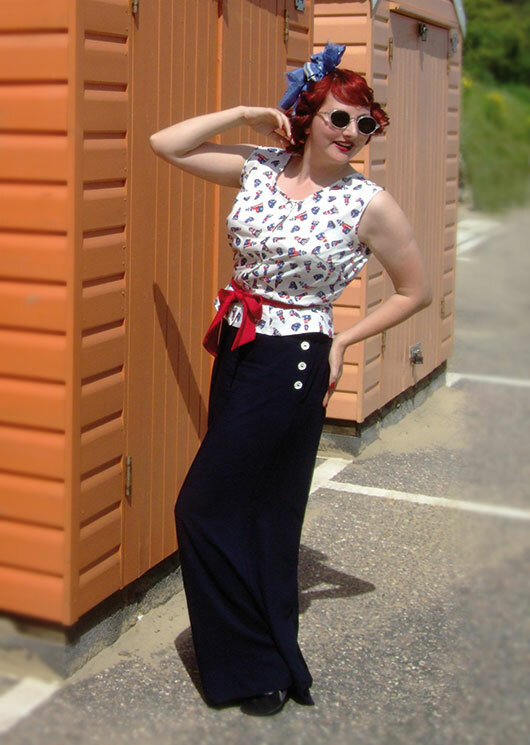 A headscarf kept your pin curls in check, or perhaps you might have a big hat and a sash at the waist. The trousers seemed to have two fashionable lengths. One sand-skimmingly long so you can’t see the feet and the other just above the ankle, even rolled up, and with delightful heels that might have done double duty for evening dancing. Perhaps it depended where you were, or the trend changed over time. Or perhaps it was to do with how many shoes you could fit in your luggage! Very soon the beach pyjama that was once for the rich and trendy caught on with those forced to holiday at home, and with the older ladies too. 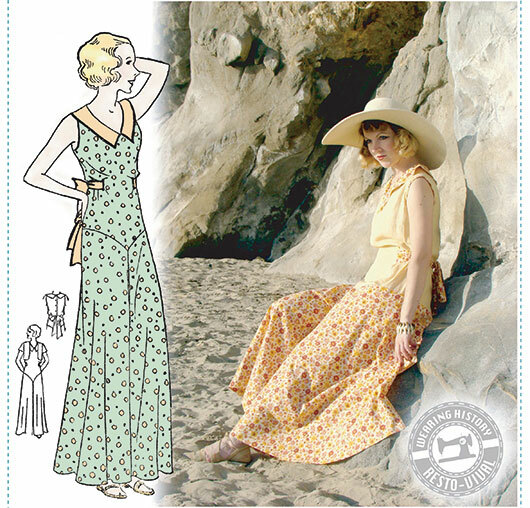 The pattern companies, as always, were quick to pick up the idea, so you could make your own. Sadly though, they were considered unappealing on larger figures and overweight women and this latest fad became the humorous topic of cartoons appearing in newspapers and magazines, and on seaside postcards. of stockings and suspenders and dresses that you had to hitch about in order to sit carefully. In pyjamas you could sit brazenly cross-legged or climb along rock pools without concern. No wonder we never did away with trousers ever again! So where might you get yourself kitted out? Well, funnily enough, Heyday has some due to come out this Summer (as modelled here by Kitten von Mew). Wearing History (http://wearinghistory.clothing/) also have a delightful pattern available (see below) so you could make your own one piece version. You might also find an original set if you are prepared to pay the cost – Etsy and Ebay are the most likely haunts. 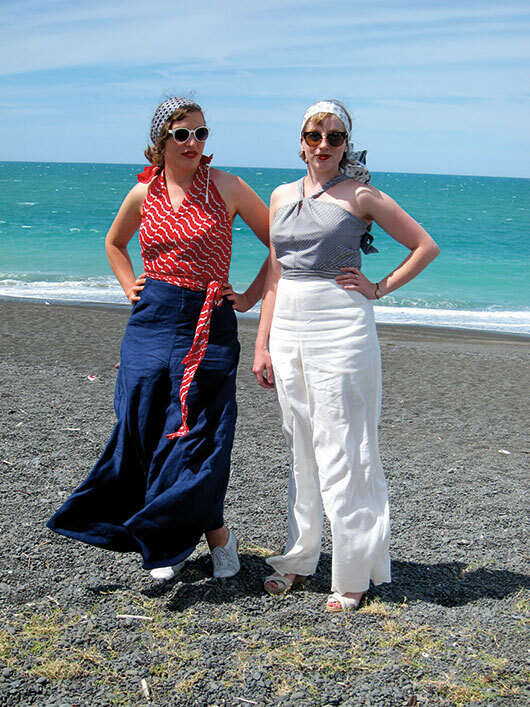 Finally, in the last couple of seasons, similar wide floppy trousers have been available on the high street too, so keep your eye’s peeled, just in case! You’ll love the comfort factor. 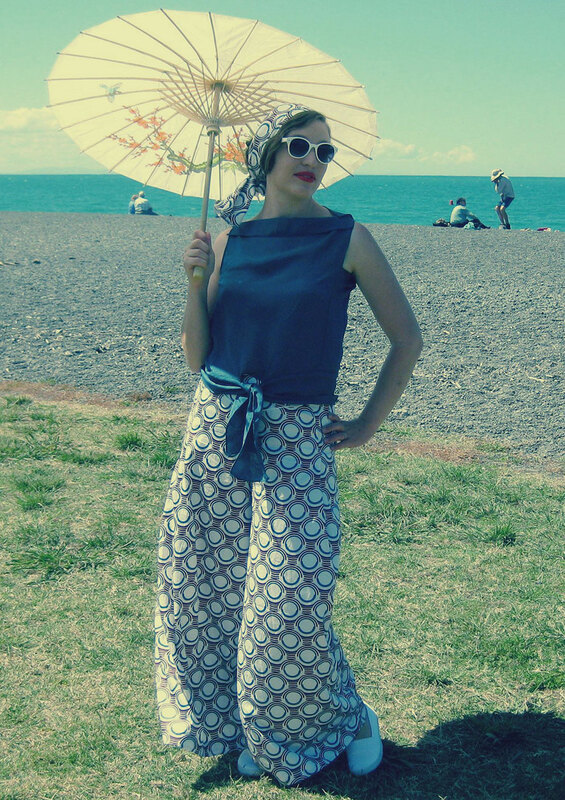 Shona van Beers owns ‘Heyday!’, making re-creations of the best of mid-century fashions, updated for modern figures and lifestyles. 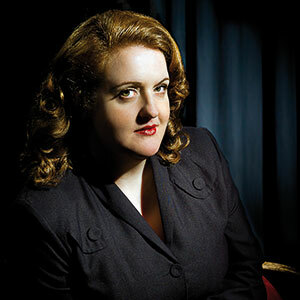 Her style motto is vintage should be easy to wear, and suit the person as well as the figure, because only when you feel comfortable can you really look elegant and stylish… and dance!